If you’re a business owner, transition to GST from the previous tax regime would bring a lot of questions to your mind. This section talks about a few important things that you should know while moving to the GST regime. 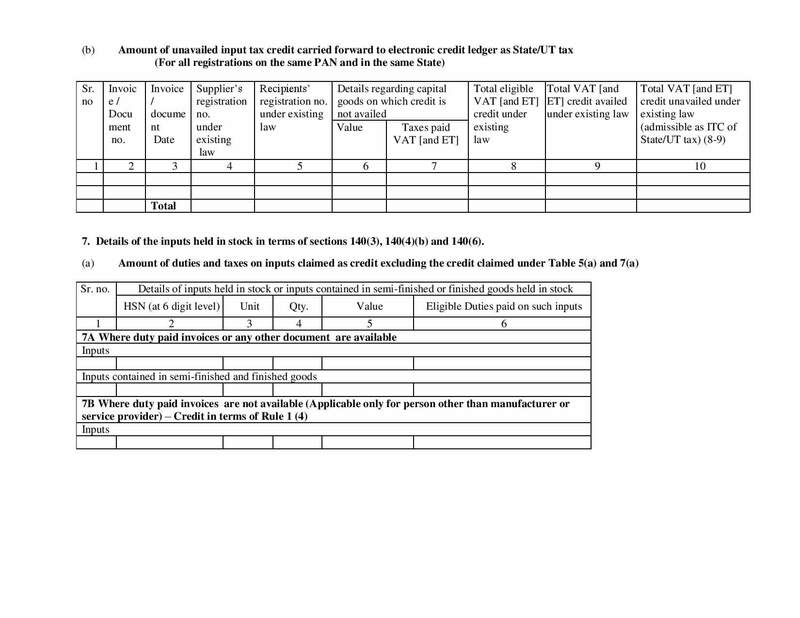 Transfer of Input Tax Credit. Credit for Excise and Additional Custom Duty. Transition provisions for Composition Scheme. According to the Model GST law, a taxable person can take credit for the tax amount, which they paid while purchasing capital goods for the company. Any input tax credit from the previous tax regime could be passed on as input tax credit in GST while migrating to the GST regime. Let’s take an example: July 1, 2017 is the appointed day for the GST rollout. As a business owner, you must make sure that you’ve made a complete list of all the stock as on June 30, 2017 and claim input tax credit while filing returns for the period ending June 30, 2017. It will be eligible for input tax credit under GST only if all such goods and services mentioned in the return are eligible for such credit under the new GST law. You should do this within 60 days from the appointed day (in this case, July 1, 2017). 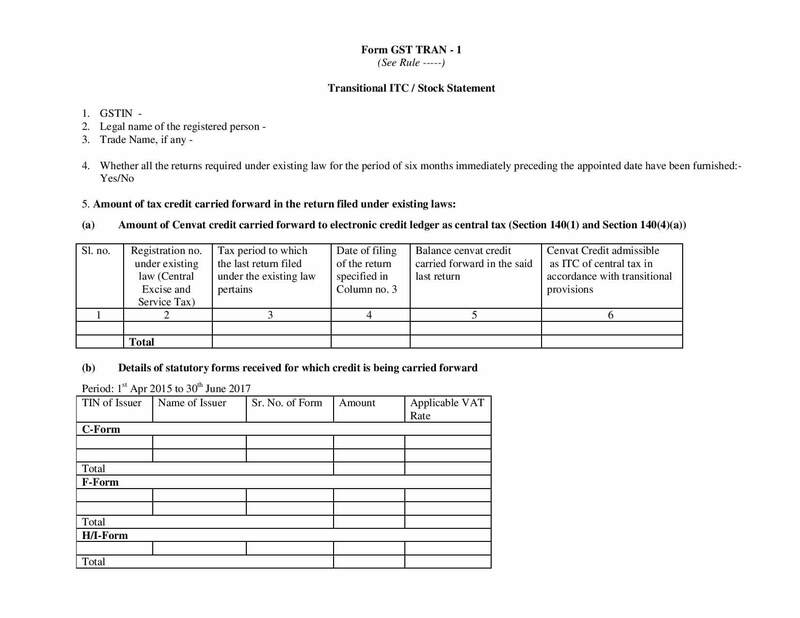 To move your input tax credit into the GST system, you will have to log into the GST portal and submit either one of the electronic forms; the TRAN-1 or the TRAN-2 as applicable, mentioning the amount of tax or duty, you wish to claim as credit. The name of the supplier, serial number and date of issue of the invoice by the supplier or any document on the basis of which credit of input tax was admissible under the existing law. The description, quantity and value of the goods or services. The amount of eligible taxes and duties or, as the case may be, the value added tax [or entry tax] charged by the supplier in respect of the goods or services. The submitted application will be processed by the tax department. 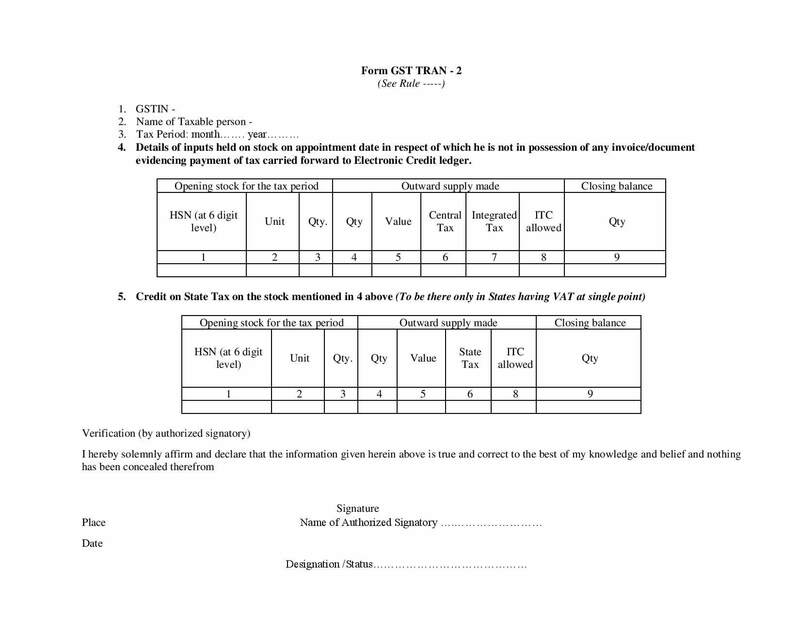 Upon approval, the amount of credit allowed will be credited to the electronic credit ledger of the applicant under the form GST PMT-2 on the Common Portal. The transfer of credit to GST is similar for businesses who were previously registered under Excise duty, VAT, or Service tax. Legal name of the registered person. A declaration on whether all tax returns under existing law are filed on time (before the appointed date). Amount of ITC carried forward according to the returns filed under the pre-GST regime. This includes CENVAT credits, credits due to statutory forms (C form, F form, H/I form) and state or UT tax credits. Details of inputs held in stock. This includes items for which the ITC has been claimed under the pre-GST regime, with or without invoice details. 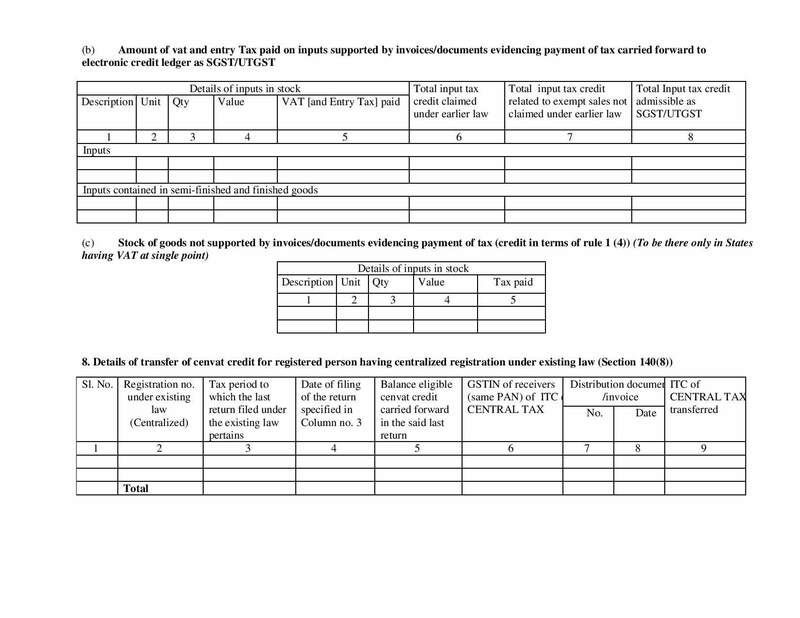 Details of cenvat credits transfered by a person having a centralised registration under the pre-GST regime. 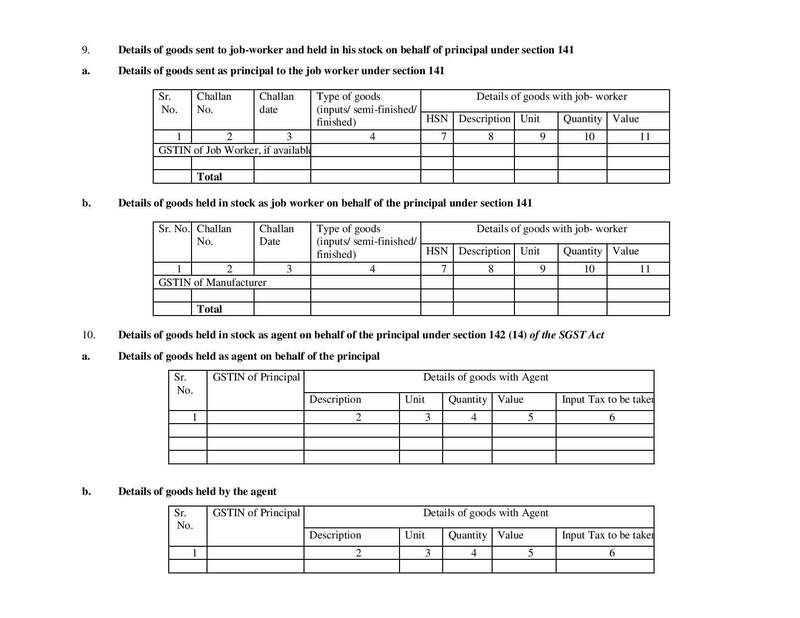 Details of goods sent for job work and held by the jobworker on behalf of the registered taxpayer. Details of goods held as an agent on behalf of another taxpayer. 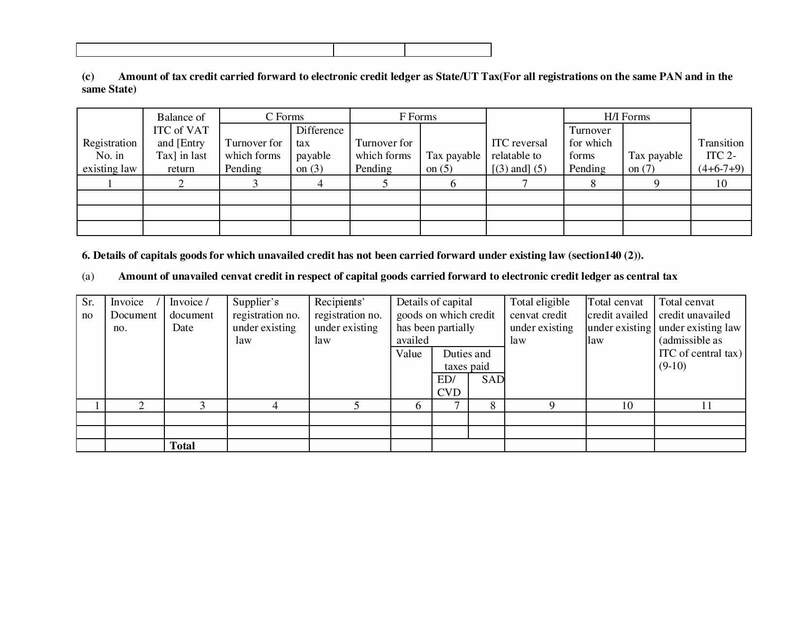 Details of credits availed under section 142 (11 ©). Details of goods sent on approval basis, six months prior to the appointed day. Finally, like all forms, it will contain a declaration of truth that needs to be duly signed by the registered taxpayer. 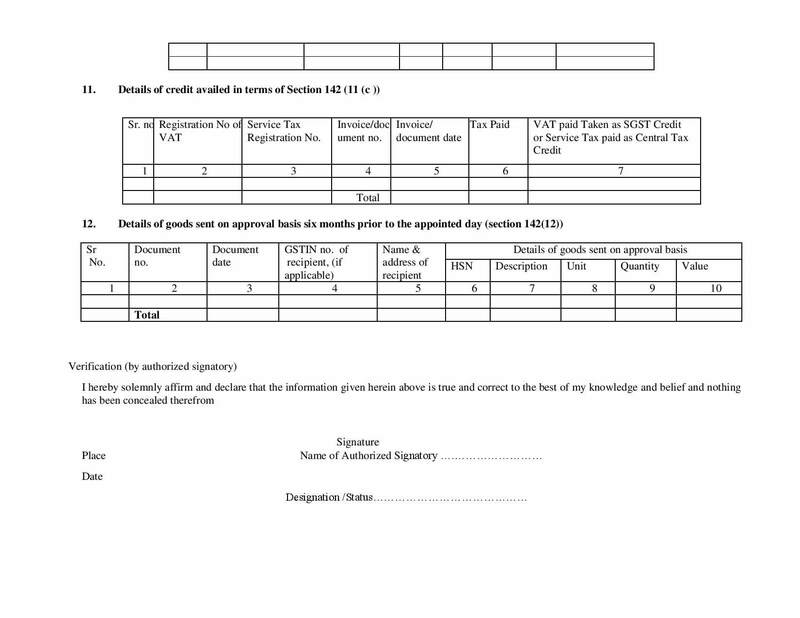 This form is to be filed by every person who had never registered under any tax authority during the pre-GST regime, be it under Central Excise act, service tax laws, or the state VAT, but is in possession of stock on 1st July, 2017 for which they may or may not have any track of the taxes paid on imputs. As per the previous tax regime, a manufacturing business was charged excise duty on manufacture of goods. Also, they weren’t given credit for excise duty and additional custom duty. Now, with the new tax regime GST is charged on the supply of goods and not during the manufacture. Now, businesses transitioning from Excise to GST will be taxed again during the supply of goods, and also won’t be eligible for credit. This may affect the profit margin of such businesses. Transitional provisions for such cases is not clearly defined yet. A significant number of small businesses still sell products without invoices. They don’t keep track of their accounts using a ledger, or have an accountant to help them manage their accounts. Such businesses can use the Composition scheme to stay compliant with GST. In the composition scheme, small businesses who have an aggregate turnover of less than 75 lakh rupees per annum agree to pay a percentage of their annual turnover as tax to government instead of accounting for each and every transaction. To learn more about the composition scheme, click here. When a business decides to move from the previous tax regime to composition scheme in GST, it must pay an amount equal to its available input credit. The input credit will be calculated based on the amount of input materials held in stock, as well as semi-finished and finished goods. On the other hand, when a business that has been paying composition tax wishes to switch to the normal tax scheme, it becomes eligible to take a tax credit. The credit will be calculated based on input held in stock as well as semi-finished and finished goods.